Federal Court: Border Agent Doesn't Have Immunity In Teen's Killing At Mexican Border It would be "bizarre," the majority opinion states, for a border agent to be granted qualified immunity on the grounds that the teenager was not a U.S. citizen. An appeals court has ruled in favor of the family of José Antonio Elena Rodríguez, who was shot on the Mexican side of the border at Nogales by an American agent who was on the U.S. side of the border. The teenager's mother, Araceli Rodríguez, says in her lawsuit that U.S. Border Patrol agent Lonnie Swartz violated her son's Fourth Amendment rights against unreasonable search and seizure, as well as his Fifth Amendment rights — a claim that essentially accuses Swartz of executing her son without due process. A three-judge panel for the 9th U.S. Circuit Court of Appeals voted 2-1 to allow the suit against Swartz to move ahead. "We cannot imagine anyone whose conscience would not be shocked by the cold-blooded murder of an innocent person walking down the street in Mexico or Canada by a U.S. Border Patrol agent on the American side of the border," Judge Andrew Kleinfeld wrote in the majority opinion. Swartz had argued that as a federal agent, his actions are covered by "qualified immunity." After a district court disagreed, Swartz appealed — putting the matter into the hands of the 9th Circuit panel. The U.S. government filed a brief in support of his appeal, saying the plaintiffs had no grounds to sue Swartz. The civil case has raised complicated questions about law enforcement agents' legal immunity — and whether the U.S. Constitution protects foreign nationals. 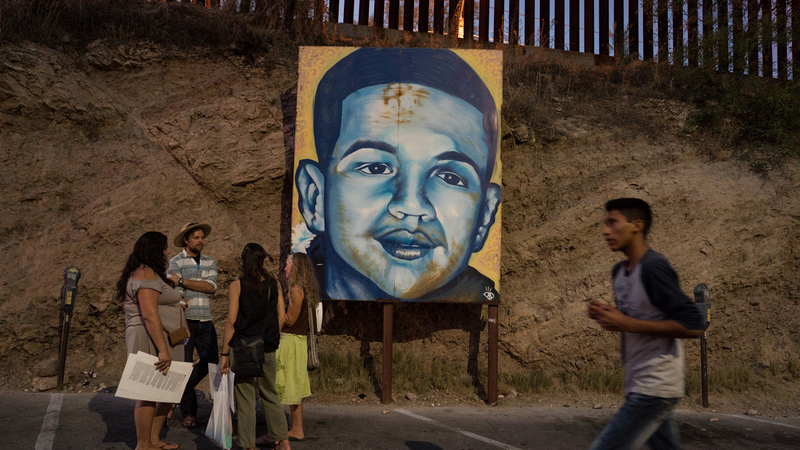 Swartz fired at José Antonio Elena Rodríguez from the U.S. side of the border, but his bullets struck and killed the 16-year-old on the other side, in Nogales, Mexico. The killing took place late on the night of Oct. 10, 2012. Swartz shot Elena Rodríguez around 10 times, including eight times in the back, according to the medical examiner in Sonora, Mexico. The U.S. agent said he had acted in self-defense after rocks were thrown over the border. Swartz fired from behind a tall metal fence on an embankment that runs parallel to — and some 20 feet above — International Street in Nogales, where Elena Rodríguez had been walking when he was killed. The incident produced a legal first in 2015, when Swartz was indicted on murder charges for the cross-border shooting. That criminal trial ended in April, when a jury acquitted Swartz of second-degree murder and deadlocked on a count of manslaughter. Swartz "has been on unpaid administrative leave since his indictment in 2015," his attorney, Sean Chapman, told NPR. When asked about any plans to appeal Tuesday's ruling, Chapman said, "We will either file a motion for rehearing en banc" — referring to the full circuit court, rather than a three-judge panel — or ask the Supreme Court to take the case. In allowing the civil lawsuit to proceed, the 9th Circuit judges also sought to give new context to a legal precedent in the U.S. Supreme Court's 1971 ruling in Bivens v. Six Unknown Named Agents of the Federal Bureau of Narcotics. The landmark Bivens case covered the actions of federal agents who were found to have violated constitutional protections, but it did not involve a cross-border action. As they invoked Bivens in the current case, Kleinfeld and Judge Edward Korman said in the majority opinion that they did so because "no other adequate remedy was available." In his dissent, Judge Milan Smith Jr. said that it's up to Congress, not the courts, to provide a remedy for damages in such cases. He said the majority was going too far in extending Bivens. "In holding to the contrary," Smith wrote, "the majority creates a circuit split, oversteps separation-of-powers principles, and disregards Supreme Court law. I therefore respectfully dissent." The "circuit split" Smith mentioned refers to the 9th Circuit reaching a different conclusion than the 5th Circuit did in a recent similar case — a situation that likely bolsters the chance that the U.S. Supreme Court will eventually take up the issue. The judges who ruled in Rodríguez's favor said that while federal law bars the U.S. from being accountable to foreign laws, the plaintiff in this case is seeking to hold Swartz accountable under the U.S. Constitution. Kleinfeld wrote in his opinion, "We are applying the Constitution to afford a remedy to an alien under these circumstances." The Rodríguez case had been put on hold in late 2016, as the Supreme Court was considering Hernandez v. Mesa, a case that revolved around a U.S. Border Patrol agent who shot and killed 15-year-old Sergio Hernández, in a culvert between the U.S. and Mexico at the El Paso, Texas, border. Last summer, the Supreme Court sent the Hernández case back to the 5th U.S. Circuit Court of Appeals, giving the plaintiffs a partial victory by saying the lower court erred when it found the U.S. border agent in that case, Jesus Mesa Jr., had qualified immunity. In part, the lower court had reasoned that Hernandez wasn't protected by the Constitution because he wasn't a U.S. citizen. The Supreme Court said that because Mesa hadn't known "Hernandez's nationality and the extent of his ties to the United States" when he shot at him, those facts were irrelevant in deciding whether the agent's actions were legal. The 9th Circuit judges said the facts about Elena Rodríguez's citizenship were similarly irrelevant. It would be "bizarre," the majority opinion stated, for Swartz to be granted qualified immunity on the grounds that the teenager was not a U.S. citizen. Art del Cueto, head of the Border Patrol union in Tucson, Ariz., warned that Tuesday's ruling could embolden people who want to carry out cross-border attacks on U.S. agents, as Arizona Public Media reports. Rodríguez has pursued her lawsuit with the help of the American Civil Liberties Union. Lee Gelernt, deputy director of the ACLU's Immigrants' Rights Project, said that the panel's decision "could not have come at a more important time, when this administration is seeking to further militarize the border."